Make sure you check both ways before coming out of the “adult video” stores today if you live in Ottawa. Google street view cars are on the streets. I spotted one this morning around 8:30AM coming onto the 416 North bound at Fallowfield. To bad I don’t seem to be able to figure out how to use my camera phone or I’d have a picture to show too! Here is an example of what the car looks like. It’s just a regular looking gray Chevrolet Cobalt with a huge mast on the top. 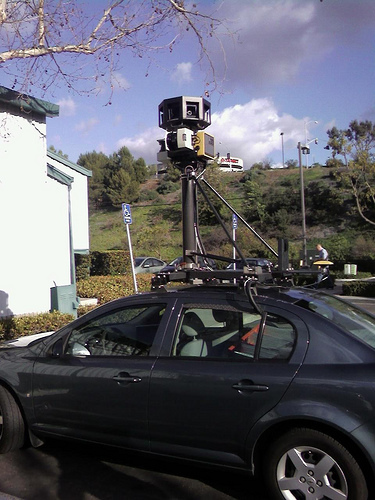 This entry was posted in Automotive, Technology and tagged Google, google maps, street view on 2009/04/14 by Jeff Ivany. Jeff is married and has two beautiful girls that talk non-stop, and a quiet little boy. He has to resort to posting on the web so that he can fit a word in edgewise. Find out more about Jeff Ivany.